In this step-by-step guide I teach you how to troubleshoot and analyze the crash dump file that is the direct result of the infamous Blue Screen of Death in every Windows version from Windows 2000, Windows XP, Windows Vista and Server 2003 or 2008 to Windows 7, 8 and Windows 10 (and also Windows Server 2012, 2012 R2 and 2016 operating systems). When you least expect it your computer might show you a so called Blue Screen of Death (BSOD) and restart the computer automatically. The BSOD is always the result of a critical system error and Windows can no longer keep on running when that occur and instead crashes. About 80 percent of all BSODs occur because of bad drivers. Hardware problems such as corrupt memory modules or a broken hard drive generally also produce a BSOD every now and then. The standard setting for when a crash occurs is that Windows restarts automatically, which means you cannot read the error message in the actual blue screen before the computer restarts. You can adjust this setting in System > Advanced system settings > Startup and recovery settings and uncheck “automatically restart”. But even if you then have the chance to read the error message on the blue screen it does not necessarily mean that you can understand it and find the cause of the problem. That’s where this guide comes in handy. When your computer crashes a snapshot of the memory is dumped to a file on your computer. This is the file that contains the key to the crash and to analyze it first open it by going to Open and then choosing Open Crash Dump. 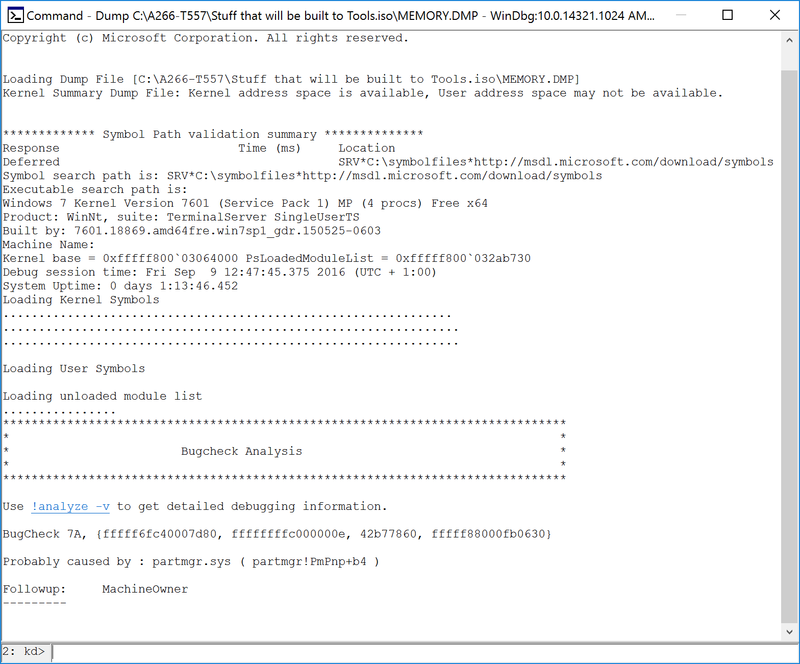 Usually the crash dump file is named MEMORY.DMP and is located in the root of the WINDOWS (or WINNT) folder. 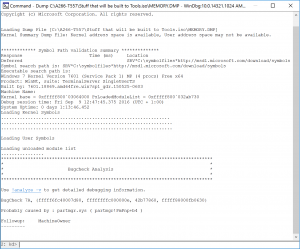 There can also be mini dumps in the “minidumps” folder in WINDOWS which can be used if there are no MEMORY.DMP files available. Browse to the DMP file and choose to load it and if you get a question if you want to save the workspace you choose Yes. The necessary symbol files will now be downloaded from Microsoft. 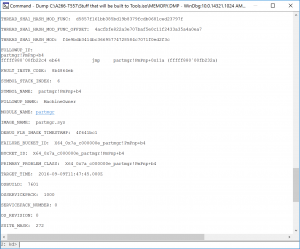 When that part is done the crash dump file will be analyzed in a preliminary way. and then press Enter. An analysis is now done and you will get information about which files and drivers are involved in the crash, or if there is faulty hardware that is likely causing the crashes. You can with the above information at least find out what the cause of the crash is and most times the crashes happen due to bad drivers. Which driver is causing the crash can be found out by either the driver name or by using your favorite search engine to lookup the file name mention in the analysis. 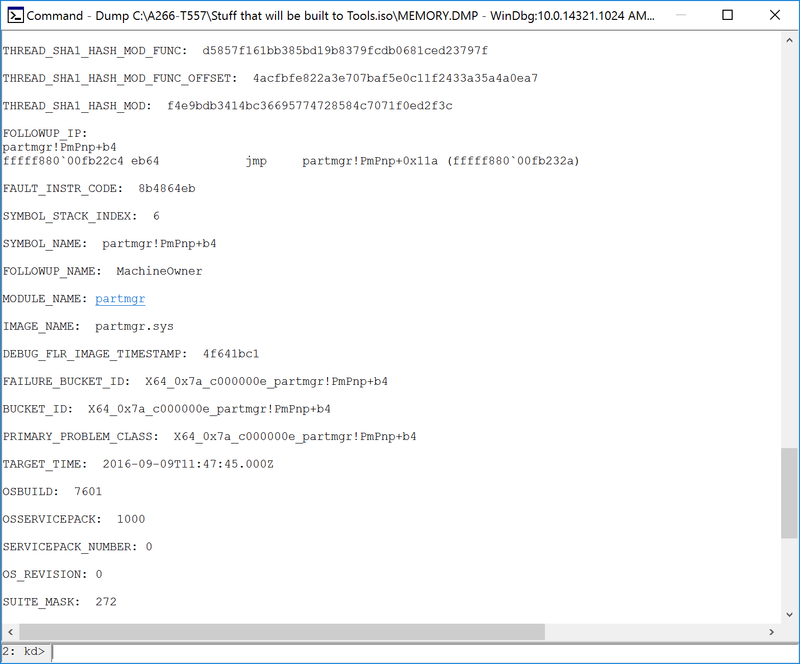 For example, nv4_disp.sys is related to Nvidia and ati2dvag.sys is related to ATI. If you learn that a specific driver is causing the crash immediately go to the hardware vendor’s site and see if there is an updated driver available, if not submit a bug report with the hardware vendor or computer manufacturer.